Philbert ‘Phil Phil’ Edwards being escorted out of court by police. A 39-year-old miner, who allegedly killed another man 17 years ago, has finally appeared at the Georgetown Magistrates Court to be charged. It is alleged that on May 3, 1999, at 7 Miles Mahdia, Philbert Edwards called ‘Phil-Phil’ murdered David Ramcharran. The Prince Ville Mahdia resident was not required to plead to the indictable charge when it was read to him by Chief Magistrate Ann McLennan. 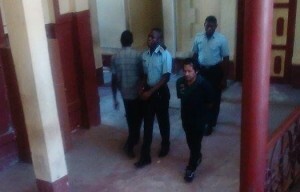 He remains on remand and the matter has been transferred to the Mahdia Magistrate Court for January 17, 2016. According to reports, the murder took place over cigarettes. Edwards was arrested some time earlier this year by ranks at Mahdia, during which time he reportedly admitted to the crime. Demwaves online news understands that when Edwards taken into custody, it was not for murdering Ramcharran, but for stabbing his own brother. At the Mahdia Police Station, a villager reportedly informed police that the suspect was also wanted for Ramcharran’s murder. In his statement to the police, the accused had related that on the day of the murder he went to ‘the landing’ where he bought two cartons of cigarettes. The miner then met Ramcharran and another man, and they began to consume vodka and water. Demerara Waves understands that during the drinking spree, Ramcharran collected the Edwards’ cigarettes, which the suspect later asked for. Ramcharran allegedly responded to the miner cursing him and threatening him with a cutlass. Edwards had reportedly told police that he fled and Ramcharran and the other man pursued him using a flashlight (since it was around 22:00hrs at the time). Police heard that Ramcharran eventually caught up with his assailant, and during his attempt to chop him, the defendant stabbed him. The suspect reportedly returned to Princeville, where he disposed of the knife in the Potaro River and headed to the back-dam to work. He later learned that Ramcharran had died.